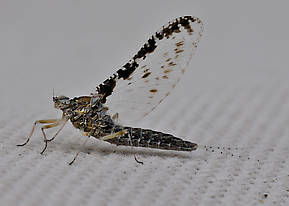 Callibaetis species usually produce two and sometimes up to three broods in a single season. Their peak times vary widely by location. Callibaetis duns emerge on the surface. They can take flight quickly or ride the water's surface for a lengthy period, depending on circumstances. 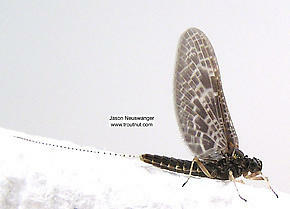 Knopp and Cormier write in Mayflies: An Angler's Study of Trout Water Ephemeroptera that the nymphs make several trips to and from the surface before hatching, a habit more common in the Ephemerellidae family. The hatch may last for several hours during the cooler weather of spring. In the West, duns most often appear mid-morning before the ever present wind comes up. Soft overcast days are optimal and during these conditions the duns will come off in waves lasting for hours. Mixed with nymphal activity and interpersed with spinner falls, the trout are presented with quite a feast. They have distinctive flight patterns consisting of foot-long, fast vertical undulations as if they were suspended on invisible rubber bands. Angling literature is replete with descriptions of this behavior often referred to romantically as the "mating dance." A very interesting quirk of this genus is evidence that suggests the tiny nymphs hatch from fertilized eggs almost as soon as they hit the water. To make this possible, the females would have to wait on land for an extended period after mating to allow incubation before they can oviposit. They often spend considerable time on the water either during or immediately after ovipositing and they often do this in a full upright or semi-spent (Spent: The wing position of many aquatic insects when they fall on the water after mating. The wings of both sides lay flat on the water. The word may be used to describe insects with their wings in that position, as well as the position itself.) condition, at least at first. This offers excellent dry fly opportunities. The spinner falls can occur at any time during daylight hours so it pays to be observant and prepared. 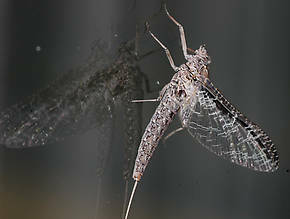 In the West, ovipositing seems to be more dependant on wind than any other factor. As with the duns, during periods of calm they can come on in waves only to dissipate quickly as wind comes back. The natural spinner's tails are widely spread, and this trait should be copied on all imitations. The nymphs are excellent swimmers in their slow-water environment. They dart around through the aquatic vegetation, often perching on stems and leaves in plain view of their predators. Trout often forage actively through the weeds for them, stirring up the plants to knock the nymphs loose. As mentioned above, the nymph's habits prior to emergence further expose them to trout predation. Fishing nymphal imitations on a greased leader in and around weed beds with slow twiches and short strips is often a deadly technique, particularly during the prehatch period in calm conditions. 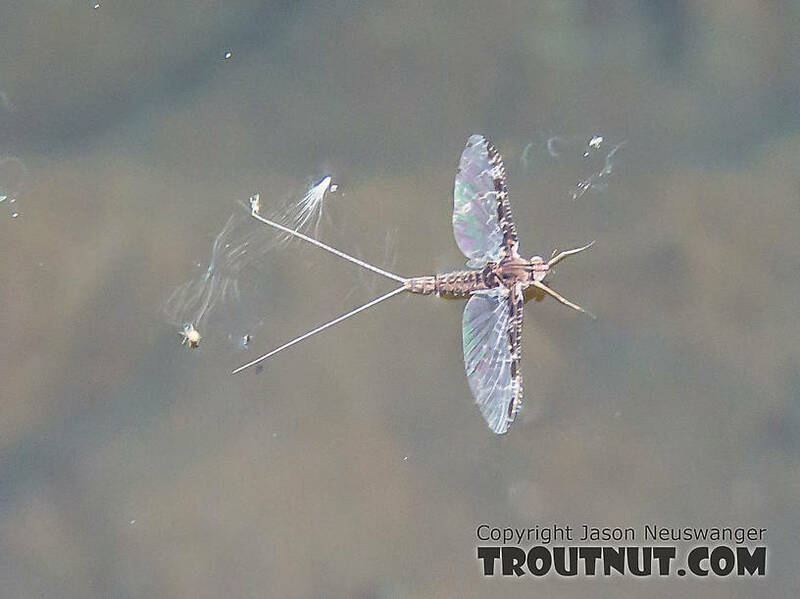 Because these nymphs are so common in some waters, their imitations make good searching patterns (Searching pattern: Any artificial fly pattern used when trout that aren't feeding selectively on anything in particular. A searching pattern may be an attractor or an imitation of something specific that the fish might favor even though it's not currently hatching.) when nothing's hatching. With almost 40 years lake fishing experience in the Northwest (Washington) our callibaetis always seem to start hatching mid afternoon in the evening, mate overnight then the spinners start in the morning. The spinners draw the most intense "rise." I put rise in quotes because it is so delicate there it leaves almost no disturbance at all not even a sip.